AASGARD/BRIARGH "Restoration/Kydoimos" CD -Excellent split of Greek and Spanish true underground Black Metal. ACTUM INFERNI "The Embodiment of Death" MC -Amazing blasphemous Polish Black Metal recalling the spirit of the nineties, highly recommended! AKERBELTZ/WAFFENTRÄGER LUZIFERS/NEBRUS "Slaughtered Whores Of Satan" CD - Pure Old School Blasphemous Black Metal. ALRUNA "Rehearsal MMXIII" MC -Mysterious, evil and utterly obscure raw Black Metal originating from the darkest pit of Linz, highly recommended! A.M.S.G. "The Forbidden Transformation" MC -Three tracks of melancholic, weird and bizarre Black Metal are not for the faint at heart. AZELISASSATH "Evil Manifestations Against Mankind" CD -A sudden, unprovoked proclamation of raw, grim and glorious depravity, highly recommended! BEHEMOTH "The Return of the Northern Moon" CD -Digipack version on Witching Hour Productions, mandatory! BEHEMOTH "...From the Pagan Vastlands" CD -Digipack version on Witching Hour Productions, mandatory! BILSKIRNIR "Atavismus des Glaubens" CD -Back in stock! 2009 edition on Nykta, a mandatory album. BLACK WITCHERY "Inferno of Sacred Destruction" CD + DVD *$16.00 CAD -More caustic, close-minded, and crushing than ever, this unholy Black/Death speed trinity create an unholy conflagration guaranteed to devour and destroy even the most battle-hardened underground warrior. BLAKULLA "Hymns to the Past Glory" MCD -Three tracks of pure Black Metal in the ancient spirit, including a Seigneur Voland cover. BRIARGH "An Antiguo Trono Olvidado" CD -Celtic Black Metal from Spain. BRIARGH/HEILNOZ "Omen of the Last Autumn" CD -A great split of Celtiberian War Black Metal! CELTIC DANCE "Ancient Battlecry" CD -Re-recorded album from 1998 with a bonus track never recorded before. CREPUSCULUM/LEICHENGOTT "Pestis Mordet Corpora Eorum" MC -Black Metal against tolerance and morality. CRYPTAL SPECTRES "Night Fear from Ritual Krypt" MC -Traditional Black Metal from Poland with connections with Faustian Funeral, Necrostrigis, Ravenmoon Sanctuary and more. DARK FURY "W.A.R." MC -Back in stock! Their most radical album so far, highly recommended! DARK FURY "Semper Fidelis" MC -Back in stock! Tracks off the first four demos, Night and the Fog Part III and unreleased material from this cult Polish horde. DARK FURY "Synningthwait" MC -Radical Polish Black Metal, highly recommended! DARK FURY "Synningthwait" CD -Radical Polish Black Metal, highly recommended! DER STURMER "Areifatoi" EP *$10.00 CAD -If you need a description, you don't need it. DER STURMER/WEHRHAMMER "Split" EP *$10.00 CAD -If you need a description, you don't need it. DESTROYER 666 "Unchain the Wolves" MC -Epic and anthemic Black Metal songwriting, gritty yet considered execution, and each song as integral as the last. DIVINE BLASPHEMY "Plague of Death" MC -Old School Black/Death Metal, reminiscent of the late eighties darkened underground. DOMGARD "Myrkvidr" CD -Ten tracks filled with evil atmosphere, eerie mysticism and blackest witchcraft. DRAPSNATT "Skelepht" CD -Black Metal Art entwined with acoustic passages of nocturnal woodlands, nordic progressive music and cold cosmic melodies. DREADFUL RELIC "Archaic Conjurations" MC -Six tracks of Hellenic Black Mythical Metal, highest recommendation! ENOID/MORTUUS CAELUM/DIZZINESS "Impetum In Tenebris" CD -True underground Black Metal 3-way split released under the banner of Lower Silesian Stronghold. ENSLAVED "Frost" CD -Osmose Productions version, mandatory! EVILFEAST "Wintermoon Enchantment" CD -Majestic Black Metal atmospheres and haunted ambience, highly recommended! FEIGUR "I, Pestilence" MC -Cult atmospheric Black Metal EP which has been sold out for several years, now reissued on cassette via Ogmios Underground. FEIGUR "II, Desolation" MC -One of the best french atmospheric black Metal record, an excellent debut album. FRONT BEAST "Wicked Wings of Wartjalka" MC -An immense raw production and evil atmosphere with crushing off-kilter and filthy guitar riffs backed by harsh, rasping shrieks from the pits of hell. GEIMHRE "Mollachd" CD -Reissue released via Lower Silesian Stronghold and Hammer Of Damnation, totally remastered, with new layout and bonus tracks. GHOST KOMMANDO "Abraxas Rising" MCD -The Swiss returns with a new effort delving into the mysteries of Abraxas. GONTYNA KRY "The Blood of our Fathers" MC -Retain the folk elements and völkisch spirit, but here sound like a Death Metal band doing covers of the old Gontyna Kry. -Without a doubt this album stands strong as one of the most significant Black Metal release ever. HELDENTOD "Live in Zatec" MC -Back in stock! A nice concert recorded of this Black Metal from Hungary. HETROERTZEN/DODSENGEL "Capax Infiniti" CD -Majestic essence of Ancient vibrations, two of the foremost and exciting groups conjoined in one Sacred Work. ILL OMEN "Spear Of Salvation" MC -Ominous force of Occult Black Metal Esoterica. ILL OMEN "Spear Of Salvation" CD -Dissonant and atmospheric Black Metal. IMMORTAL "Diabolical Fullmoon Mysticism" CD -Osmose Productions version, mandatory! IMMORTAL "Pure Holocaust" CD -Osmose Productions version, mandatory! IMPALED NAZARENE "Tol Cormpt Norz Norz Norz..." CD -Their debut cult debut CD on Osmose Productions, highly recommended! INFERNO "Black Devotion" MC -The fifth album of these Black Metal titans. INQUISITION "Invoking the Majestic Throne of Satan" MC -Bulldozing, hypnotic, ritualistic and thoroughly occult Black Metal. INQUISITION "Magnificent Glorification of Lucifer" MC -Cult Black Metal absolutely devoted to the darkside, recommended! INQUISITION "Invoking the Majestic Throne of Satan" CD -Bulldozing, hypnotic, ritualistic and thoroughly occult Black Metal. KRINGA "Total Mental Desecration" MLP (10 inch) -Obscure and evil Black Metal from Austria, highly recommended! MALVERY "Promo '98" LP -Obscure and cult underground suicidal Black Metal horde, highly recommended! MARDUK "Heaven Shall Burn... When We Are Gathered" CD -Osmose productions pressing of this mandatory classic. MASTER'S HAMMER "Jilemnicky Okultista" CD -Back in stock! Official Osmose Pruductions pressing, cult! MERCILESS "The Awakening" CD -Official reissue of this classic album by Osmose Productions. NECROMANTIA "Crossing the Fiery Path" CD -Cult Black Metal re-issue with original sound recording on Osmose Productions. NECROMANTIA "Scarlet Evil Witching Black" CD -Cult Black Metal re-issue with original sound recording on Osmose Productions. NOKTURNE "Embracer Of Dark Ages" CD -Blasphemous Black Metal totally influenced by violence, hatred, blasphemy, misery and torment. NORDMAN "Vertus guerrieres" CD -Back in stock! Melodic Heathen Black Metal from Quebec that reminds the early brilliant albums of Graveland. NORDMAN "Self titled" MCD -Raging Heathen Black Metal dedicated to the cold winters and howling northwinds. ODELEGGER "The Titan's Tomb" CD -Forged with hatred for a really long time with the same hostile manic sense of coldness! ORDER OF THE WHITE HAND "Veren Muisto" MLP -Third full length album, released by Sang & Sol Productions. PERDITION TEMPLE "The Tempter's Victorious" MC -Militant and malevolent blackened Death Metal featuring members of Immolation, Black Witchery, etc. PERDITION TEMPLE "Sovereign of the Desolate" EP -Both tracks here are exclusive, including a rabid, reverent cover of Blasphemy's classic "Weltering in Blood. PORTAL/BLOOD OF KINGU "Split" EP -A split between two of Death Metal's darkest and most penetrating forces. PROFOND BARATHRE "Snaar" MC -Back in stock! Ambient/Black Metal from Switzerland. REAL LIFE EVIL DREAM 3*$5.00 CAD -Fanzine français format A5 avec des interviews avec Acherontas, Cirith Gorgor, Malcuidant, Octinomos et plus. SATANIC WARMASTER "Fimbulwinter" MC -If you need a description, you don't need it. SATANIC WARMASTER "Fimbulwinter" CD -North American pressing, mandatory. SENTIMEN BELTZA "Bizitza Osoan Zehar Sortu den Etsipenaren Ondorioak" MC -Back in stock! Raw and atmospheric Black Metal, one of the few new bands that deserve attention. SEVERE STORM/SLAVECRUSHING TYRANT "We Will Drown the Dawn in Blood" CD -Raw Black Metal with a melodic edge versus Dirty Black/Thrash, great material from Poland! SVOLDER "Desecration of The Five Holy Pillars" CD -Anti-islamic Black Metal released under the banner of Totenkopf Propaganda. 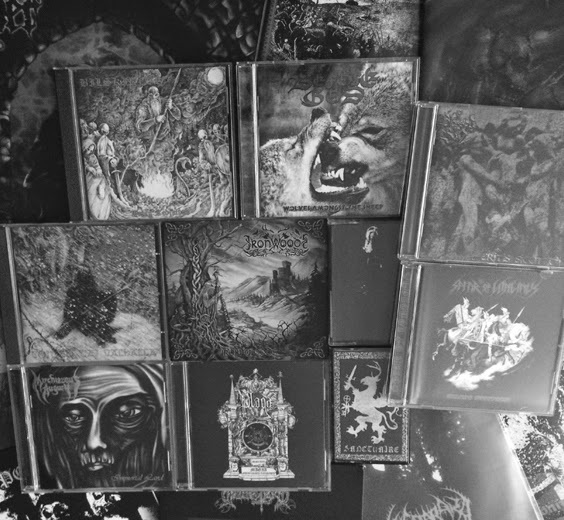 SZARLEM‎ "Cryptic Winter" MC -Abyssic Black Metal invocations against the false light. THOU ART LORD "The Regal Pulse of Lucifer" CD -An album that may be the most archetypal Greek Black Metal album released by any band in many years, highly recommended! WINTERBLUT "Das Aas aller Dinge" MC -Obscure and highly original German Black Metal, recommended! WINTERFRONT "Northwinds" CD -Pagan Black Metal from Croatia. WSCHOD "Oddalenie" MC -Back in stock! Patriotic Black Metal from Poland, their second album. -Cult sinister Yakuza Black Metal debut album, Nuclear war Now edition. AKHKHARU "Celebratum" CD -Highly enigmatic, Aeonic dark ritual ambient sound sculptures of a spiritually disturbing nature. A.M.S.G. "Anti-Cosmic Tyranny" LP -Black Metal ritual of sonic invocation to honor the endless dark aeon and the chaotic black light! ARKAIK EXCRUCIATION "Among the Vortex of Chaos" MC -Raw and filthy Death/Black Metal with rabid vocals that keep pushing the unwary into the depths of purgatory. ASUBHA/ATTRALIA "Split" EP -Pure Black Metal invoking the deathlike melodies of early Emperor and Abigor's demos meets French Black metal in the vein of Seigneur Voland, Bekhira and Chemin de haine. BAISE MA HACHE "Ab Origine Fidelis" LP -Debut album of the french newcomers, their music can be mostly compared to Peste Noire or Akitsa without loosing this own identity, highly recommended! BLACK COMA "My Filthy Ashes" MC -First recording from this Spanish Black Metal band which is featuring members of Atman and Inexorable End. BLOOD STRONGHOLD "Blood Spilt In The Earths' Viscera" EP -Medieval Black Metal, highly recommended! BLOOD STRONGHOLD "From Sepulchral Remains..." CD -Eight nocturnal hymns of medieval Black Metal for those with the darkness of war in heart! BUNKUR "Bludgeon" CD -The basis here lies in the combination of authentic Doom with black metal spiced over by hints of Laibach, Carnivore and Autopsy. CELESTIAL BLOODSHED/URFAUST "Split" EP -Back in stock! If you need a description you don't need it. CRISTALYS "In Hoc Signo Vinces" CD -Epic Heathen French Black Metal, highly recommended! CULT OF DAATH "Doomed by the Witch" MC -Mandatory Black/Death Metal from Chicago, highly recommended! DARK FURY "Semper Fidelis" MC -Tracks off the first four demos, Night and the Fog Part III and unreleased material from this cult Polish horde. DOOMBRINGER "The Grand Sabbath" CD -The cacophonous intensity of Death Metal meet the unconstrained evil of Black Metal, Nuclear War Now edition. GALGENBERG "Blutgrund/Glagenberg" CD -Back in stock! Cult Polish Black Metal act, highly recommended! GLORIA DIABOLI "Libation Unto He Who Dwelleth In The Depths" MLP (10 inch) -Pre-production tracks recorded on a 4 track machine of furious and hateful Black metal, highly recommended! GRAVELAND/HONOR "Raiders of revenge" CD -2013 digipack version. GREVANCE "Faciamvs Vt Bellvm Renascatvr" MC -Back in stock! Epic Black Metal with Folk influences from France. HATE MEDITATION 2nd issue *$6.00 CAD -Featuring interviews with Dodsengel, Panphage, Svartidaudi, Surtr, Jotunheim, Mare and more. IMPERIAL "Chaos" CD -Old school thrashing Death Metal from France. IRON WOODS "Self titled" MC -Superior Pagan Black Metal influenced by Graveland, Falkenbach, etc. Highly recommended! KAEVUM "Natur" LP -Radical Norwegian Black Metal, only a few copies in stock. KALEIDOSCOPE #12-#17 - Selected limbs and fresh blood over the carcass*$8.00 CAD -Eight old interviews from 2013 and three new ones from 2014, featuring Mysticum, Possession, Malefices, Cosmic Church and more. LAMENTATION "Self titled" MC -Rancid, traditional, furious Death/Grind in the tradition of bands like Terrorizer, Defecation, Napalm Death, Autopsy or Repulsion. MAGOG "Todesweihe" LP -Finest German underground Black Metal, their demo on vinyl. MALEFICES "Hurlemort" LP -Haunting and cryptic Black Metal hymns, echoing the glorious days of the early 90's. MENSCHENTOD "Staub" MC -German Black Metal in the vein of the French Black Legions. MENEGROTH "Das Rote Werk" CD -Black Metal influenced by the futurist movements. METASTASIS "The Blackened Essence" MC -Chilean thrashing Death Metal with fast tempos, evil vocals and killer guitar riffs and solos. MUTILATED "Resurrected" EP -Cult brutal French Death Metal from the early nineties. MYRRDIN "Gods of Ancient Times" MC -Occult raw Black Metal from United Kingdom. NECROSTRIGIS "Sinister Fire's Rituals" EP -Polish Black Metal in the truest tradition, a monument dedicated to the originators of the genre. Highly recommended! NECROSTRIGIS/EVIL ''Winter Darkness Storm'' EP -A split release between Polish and Brazilian Black Metal elite. NOCTURNAL VOMIT/CRUCIFYRE "Split" MC -Primitive, barbaric Death Metal in the vein of old Brazilian and Hellenic cults meets cryptic, evil brutal Death Metal carnage. ORDER OF THE DEATH'S HEAD "Hakenkreuz" MC -Back in stock! Debut album of radical Black Metal from France, highly recommended! ORDER OF THE DEATH'S HEAD "Pogrom Ritual" CD -Radical Black Metal from France, highly recommended! ORLOK "Black Funeral Holocaust" LP -Putrid and funeral Black Metal from Finland. ORMGARD "Ormblot" LP -Back in stock! Dark Teutonic ambient and Black Metal Art. PURE "And the Waters turned to Blood" MC -Melancholic and raw Black Metal with Doom parts from Switzerland. RAVENMOON SANCTUARY "Winter Desolation of Death" CD -Savage Black Metal combined with spacey keyboards, highly recommended! ROTTING CHRIST "Apokathilosis" 3xEP Boxset *$35.00 CAD -his collection of Rotting Christ material represents the genesis of the archetypal Greek Black Metal sound, including the "Ade’s Winds" demo and the "Dawn of the Iconoclast" and "Apokathilosis" EPs. SATAN'S SIGN OF WAR "Self titled" LP -Raw hateful German Black Metal cult. SATANIC WARMASTER "Nachzehrer" MC -If you need a description, you don't need it. SIEG ODER TOD "Jahre Der Vergessenen" LP -Discography album featuring their material from the "Sieg Oder Tod Demo", the "Blut und Ehre" compilation, the Ulfhethnar and Antiparasitär splits. SLAYER #20 Softbound Zine *$12.00 CAD -Softbound version of the sold out zine featuring interviews with Watain, Morbid, Bathory, Grotesque and more. SPEAR OF LONGINUS "The Yoga of National Socialism" CD -Digipack CD version of this cult album, highly recommended! SUNWHEEL "Industry of Death" CD -This milestone of epic Black Metal re-released on digipack CD via Darker Than Black. SVARTSYN "Aandens Melankoli" MCD -Cult Norwegian Black Metal mini-album remastered and reissued by Burznazg Productions. THE WANDERER... "Aura Nocturnal" MC -A Black Metal journey through a world of twilight toward the primordial darkness. TOMBEAU "Méphistophallique" MLP -Unique darkened occult Metal of Death that stays away from the usual "Metal Noir Québécois" standards. TOTALE VERNICHTUNG "Ritualmordlegenden" CD -Innovative and original Black Metal from Austria which still keep the true spirit. UNHOLY CRUCIFIX "Ordo Servorum Satanae" CD -Black/Death Metal with a mid-paced approach punctuated by ecstatic passages of blast beat annihilation. UNHOLY CRUCIFIX "Ordo Servorum Satanae" LP -Black/Death Metal with a mid-paced approach punctuated by ecstatic passages of blast beat annihilation. UNTERGANG "Kult of the Black Order" MC -Supreme blasphemous Black Metal from France. VARATHRON "Walpurgisnacht" LP -one of the greatest Hellenic Black Metal album of all, highly recommended! WARWULF "The Archetype of Destruction" CD -Superior Black Metal from the United States influenced by french bands such as Kristallnacht, Seigneur Voland, etc. WINTERBLUT "Der 6. Danach, Opus I: Leidenswege" LP -Originally released in 1999 under the banner of Darker Than Black Records, this album was the first proper full-length Winterblut recording and began the unfolding of what would become one of the most unique catalogs in Black Metal. WINTERBLUT "Der 6. Danach, Opus II: Geistermusik & Opus III: Orgelmusik" LP -Greater influx of the atmospheric and ethereal elements begins to manifest giving way to attain an even darker sounding Black Metal. WINTERBLUT “Von den Pflichten, Schönes Zu Vernichten” DLP -This album explores new, untouched territories within the genre and eschews the constraints of any rigid interpretation of the Black Metal genre. Best of the year list and mail order update. -Argentinian Heathen Black Metal, their fifth album. -Gildan Heavy Cotton black T-shirt with professional silk screened print on front. -The black embrace of eternity is a violent, swirling cacophony with focus given to refining compositional structures to mirror both the nuances of lost remembrances and to glorify the hallucinatory nature of despair. -A beautiful, yet unknown masterpiece of depressive Black Metal from France. -Depressive Black/Doom Metal produced by Ogmios Underground. -Back in stock! A mandatory album, highly recommended! -Old school Death Metal from Greece. -Troubled and deviant raw Black Metal from France. -Asthenic Black Metal from France, rehearsal and live tracks. -Asthenic Black Metal from France featuring a member of Angest Herre. -Seven true Black Metal spells to shatter the trembling pillars of creation one last time, highly recommended! -Raw Heathen Black Metal from Poland. -Debut full-length album of one of the best new French Black Metal horde, highly recommended! -Tolkien-inspired Black Metal landscapes with the intro and outro written and performed by Vinterriket. -Reissue of this 1998 Pagan Death Metal masterpiece. -True old school and arrogant raw Black Metal from Poland, highly recommended! -A travel through stars and space. -After 12 years of silence here is the new studio album of the mighty French Black Metal band, mandatory! -24 minutes of medieval, archaic heathen Black Metal from Poland and Australia. -Tragic and atmospheric French Black Metal. -A journey into realms of dark romantic Black Metal melancholy. CELTIC DANCE "Terror Romanorum" EP-One new song and a re-recorded track of Portuguese Pagan Black Metal. -Raw Black Metal from France in the vein of Peste noire, Autarcie, etc. Released by Drakkar Productions. -Combinations of symphonic folk elements and raw Black Metal from Slovakia. -Dark ritualistic Ambient recorded live in Paris. -Greek misanthropic, negative Black Metal in the vein of to Judas Iscariot, Sad and Sargeist. -The 2007 demo on CD. -Cruel, melancholic and hateful Black Metal in the vein of the old cults. -One-man depressive Black Metal project of Nokturn from Ciel Nocturne, Svartkrig, etc. -Ambient Black Metal from Australia. -8 tracks of weird and eerie Australian Black Metal with ambient and noise influences. -Tortured, disturbed and alienated Ambient music. -Celtic atmospheric Black Metal with vocals recalling the mighty Hate Forest. -Over 40 minutes of melodic and desolated Black Metal from Quebec, Canada. -7 tracks of pure war/pagan influenced Black Metal. -Compilation of the early material of this heathen Black Metal horde hailing from the United States of America. -Atmospheric Doom/Death anthem meets abyssal Death Metal gospel with obscure vibe of Doom metal. -American heathen Black Metal debut release. -A stunning combination of D-beat and heathen Black Metal. -Dissonant passages with a settle use of hateful psychedelia, the compositions became more demanding but are still straightforward Black Metal. -Swedish folkloric Black Metal released by Purity Through Fire. -Epic viking Folk Metal from Sweden. -Superior Pagan Black Metal influenced by Graveland, Falkenbach, etc. Highly recommended! -Featuring interviews with Ephemer, Autarcie, Black Witchery and more. -Their fourth and coldest album of Depressive heathen Black Metal. -Back in stock! A true underground Black Metal classic that is utterly mandatory, highly recommended! -Unreleased album recorded between 2004-2013. -Lo-fi and grim hateful Black Metal from Norway. -Darkened depressive ambient Music from France. -Sickened and noisy Dark Ambient from France. -Superior German Black Metal art, Mercenary Musik version. -Cult and raw Black Metal from Finland. -True Death Metal laden with atmosphere and mysticism. -Somber and morbid Italian Black/Death Metal with a unique dark voice. -Militant Black Metal from Switzerland, released by Bergstolz Records. -Chilean Doom/Death Metal in the old vein. -Obscure and satanic Death Metal, highly recommended! -23 minutes of glorious, cold unrelenting Black Metal in the purest French vein. -Two tracks of raw and cold Black Metal hailing from Malaysia. -Rotten, imperial Black Metal in the vein of Paragon Impure and Horna. -Filthy and alienated schizoid Dark Ambient. -This demo is a tribute to Ogmios Underground. -Radical Black Metal from France, highly recommended! -Brand new split of these both French Black Metal legends, highly recommended! -Compilation of demo and unreleased material of this Finnish Black Metal horde. -Atmospheric and progressive Heathen Black Metal. -Selfish misanthropic Black Metal from France. -Remorseless old school Greek Black Metal featuring an ex-member of Rotting Christ. -Harsh and misanthropic Black Metal from Italy. -unyielding and uncompromising Black Metal played in the old tradition. -Strictly limited pro-tape with restored sound and new artwork and the first of five tapes in a re-issue series to come, highly recommended! - Fast and aggressive Black Metal from Poland. -Bestial Black Thrashing Metal released under the banner of Wolfsvuur Records. -French underground Black Metal, released by France d'Oil Productions. -Finnish occult Black Metal debut demo released by Drakkar Productions. -Melancholic and atmospheric German Black Metal, highly recommended! -Twisted Black Metal released under the wings of Drakkar Productions. -Dark Ambient in the old Cold Meat Industry style from Poland. -Bestial war Black Metal band from Brazil. -Back in stock! 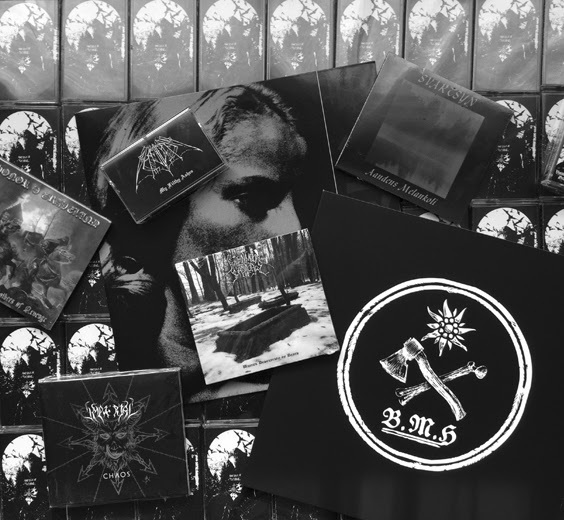 Extremely hateful and raw Black Metal from this mighty Black Metal horde from Poland. -Distortion-drenched nordic Black Metal featuring members from Taake, Disiplin, Gaahlskagg and more. -Abstract noise in the grimmest Dark Ambient tradition. -Minimal Dark Ambient tied to the Metal scene like Aghast. -Fundamentalist Dark Ambient from France. -A strong piece of cold and haunting Black Metal. -Raw and necro misanthropic Black Metal featuring a member of Vermeth. -Four hermetic hymns of archaic, pitch Black Metal from the foggy moors of ancient Keltia, evoked during the pagan summer solstice MMX on eight analogue tracks. -Fantastic atmospheric Black Metal masterpiece with some acoustic parts, reminds of Burzum, Xasthur or early Primordial. -Finnish Black-Metal somewhere between the their country mates Warloghe's genre and the old Black Legions style, highly recommended! -Compilation featuring remastered old tracks and rare songs from 2002-2004. -Cult Ambient from Germany, Frostcald Records version. -Old school Black Metal from Finland. -Aggressive but melodic Black Metal from New Zealand. -A powerful blend featuring two amazing unholy Black Metal songs, highly recommended! -Raw Swedish possessed Black Metal recalling early Marduk, highly recommended!